In the previous articles of this series we saw how to communicate with a single Siemens S7 plc. But it happens frequently to have to communicate with multiple PLCs. In that case, our HMI has to read and aggregate the data that are coming from the field and to react/notify the users in case of malfunctioning of certain areas. One of the biggest challenges in designing such applications is to maintain a decoupled and flexible architecture, so it can scale quickly as the complexity of the machine/plant grows. In this article we will see how PRISM and dependency injection will help us managing multiple PLCs in a single application. Read and write data from another PLC using Modbus protocol. As usual, when we have to add new features, we start from the UI. Since we are using MVVM pattern, we can create a Plc2MainPage and a Plc2MainPageViewModel. The Plc2MainPage consists only in a button and a led that represent the state of the variable that we read/write on the plc. You can check the code here. The Plc2MainPageViewModel must implement the new properties that we are going to refresh from the plc. It also has to implement the command to Write the variable on the Plc. Now that we created the UI and we have a clear understanding on what functionalities we need from the plc2 service, we can create the service. To do this, we have to create a new project and name it SimpleHmi.Plc2Service. Then we have to add a Modbus driver. In this project we will use NModbus4, so we can use NuGet and browse for it. As we did for the S7 service, we will create an interface that defines the properties and the methods that the service will offer. Then we will also create the real implementation of the service by using NModbus. The IPlc2Service interface contains all the methods to manage the communication with the plc, like Connect, Disconnect, ConnectionState, ScanTime and the ValuesRefreshed event. It also contains all the PLC-related values, in this case the boolean variable that we need to read and the method to write it. To create the real Plc2 service we create a class ModbusPlc2Service. 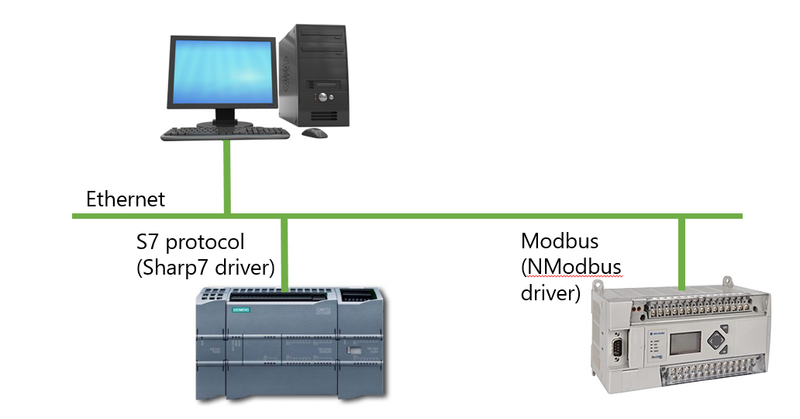 If you are not familiar with NModbus, you can read an article here. In this class we use the same approach that we used with the S7 service. We use a multithreaded timer (System.Timers.Timer) that ticks once every 100 ms. The Connect and Disconnect methods will be responsible for creating the socket and starting the Timer, and when the Timer ticks we read the variable in the callback. We also implement the Write method by using a Task, so we can execute it asynchronously from the UI thread. You can read the code of Plc2Service here. 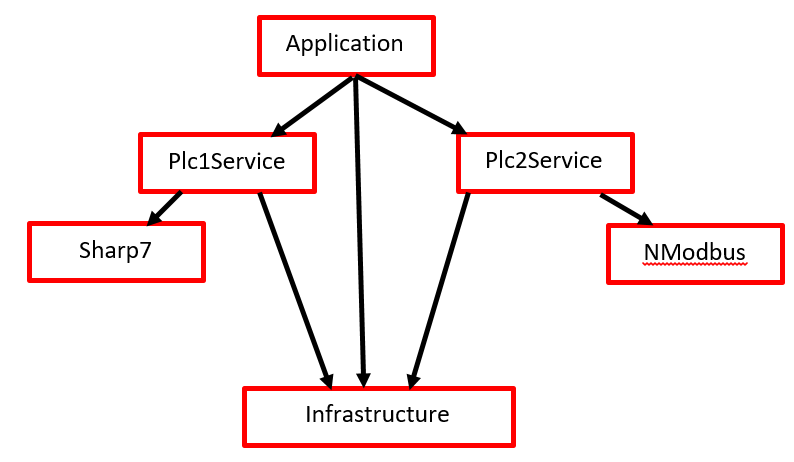 One of the problems that we face when creating the IPlc2Service is that it needs the type ConnectionStates. 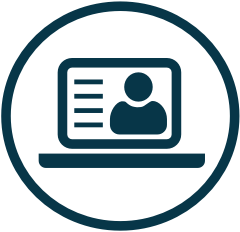 ConnectionStates is part of Plc1Service, which has nothing in common with Plc2Service, except for this class. With PRISM it’s convenient to put all the Common components in a dedicated project called Infrastructure, and reference this project from the other projects. By putting all the common parts in the same assembly, we obtain a cleaner dependency chart and decoupled components. You can read the Infrastructure classes and project here. To use the ModbusPlc2Service in our application, we have first to register it in the container. To do this we have to open the bootstrapper class and register it as SingleInstance, same as we did with the S7 plc service. After registering the service, we can use it in Plc2MainPageViewModel, just by using Dependency Injection in the constructor. To do that, we have to create a private read-only variable to reference the service. Then we can subscribe to the ValuesRefreshed event to update our UI variable. We can also implement the action for the Write Command that we wrote before. 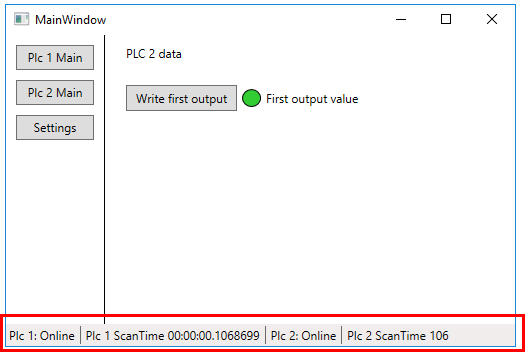 In the previous articles, we were displaying in the StatusBar if the Plc1 was Online/Offline and the PLC scan time. 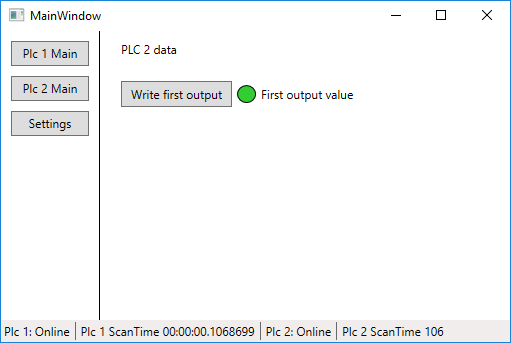 Now that we are reading from another plc, we need to show also the connection state and the scan time of the Plc2. To do that, we modify the UI of the StatusBar to add two more fields. You can read the xaml code here. Then we have to update the HmiStatusBarViewModel to refresh the UI values. Same as before, we will use Dependency Injection to get our services from the constructor, so we can subscribe to both ValuesRefreshed events. In the previous application, we were connecting to the plc by adding the IP address and clicking “Connect” button. This was not optimal, because our application should be able to auto-connect to the PLC at startup, especially when communicating with multiple PLCs. To implement the auto-connection, we have to change the Connect methods to remove all the parameters. And to keep things simple we will hardcode the ip address and other parameters in the Plc service. At last, we have to call the Connect method at the application startup and Disconnect at the application shutdown. We can do this in the MainWindowViewModel class, again by using Dependency Injection in the constructor to resolve the two plc services. Then we have to create two commands: ConnectPlcCommand and DisconnectPlcCommand. Now to call these commands from the Loaded and Closing event of the MainWindow, we have to use Triggers and Interactivity. This application has also a dummy Plc2Service so you can launch it even if you don’t have the real hardware. To change the type of service, you can go on bootstrapper class and comment/uncomment the service implementation that you need. You can find the source code on my GitHub repository. Can yu share yur rmail here? Sometimes i trouble with problems.Because of this i nneed to ask something.Other things do you have knowledge abut mbus communication with c#? Hi; with raspberry; i follow you’re tuto but on this rpi and Win10, only UWP’s apps is supported. Can i converte you’re WPF app with software Microsoft to UWP app ?? Thank lot for you’re answer. In UWP the bootstrapper is in App.xaml itself. You can use Prism (here the main example ) or another good framework is Template10. Firstly thank you for this valuable article. What should I do if I want to connect multiple Siemens PLCs by using S7 service? What I want to do is the same as you wrote in this artcle but only difference is I am gonna use one S7300 and one S71200. I would like to make PLC1 and PLC2 main pages exactly same with same data blocks content and controls. Any help would be very appeciated. Hi Michele, first off thank you for writing these articles up and also doing the videos on youtube, they are a great source of information. The one question I have for you, how would you go about handling 2 instances of the same PLC? Say you had a machine hooked up to 2 S7 PLCs, since you register each service as a singleton, you wouldn’t be able to do this. From your experience, would you modify the PlcService to handle a collection of same type PLCs instead of just 1? Or would you maybe register them as singletons for each but give them a name attribute so you can distinguish them when needed (if that’s possible)? can i read many siemens plc like s7-1200 using 1 s7Client of Sharp7 in 1 project ? My doubt is, after developing application how do we run application in other system without visual studio.